Reviewing and editing processes for submitted manuscripts is performed on the internet with email and a secure file transferring server. The final decision of acceptance or rejection of the manuscript will be decided within two months at best. The following flowchart shows the relationship of above processing steps and expected processing times. The author submits a manuscript through the web page system. Manuscript Check List must be uploaded at the same time. The author(s) should recommend five potential reviewers by including the list of the reviewers with full names, titles, affiliations, and email addresses. If this is a resubmission, please mention the previous manuscript number. Editor-in-Chief examines the content and assigns an appropriate editor to process the manuscript. The assigned editor will be informed after giving the manuscript number. The editor preliminary evaluates the manuscript by his/herself and is entitled to reject the manuscript before the review process if the manuscript does not follow the Guidelines for Authors or if the contents and language do not meet the scientific standard of Hydrological Research Letters. The editor reports the notice of the rejection to Editor-in-Chief if so and finishes the review process within a few days after the received date. The editor examines the content of the manuscript and assigns at least two reviewers in the proper area with consideration of the list provided by the author. The manuscript is transferred to the reviewers for the review. The reviewer evaluates the paper and makes a constructive comment to the author in order to improve the manuscript. The review process must be completed within two weeks if there is no specific reason. The editor transfers the reviewers’ comments to the author, and requests a prompt and adequate revision of the manuscript. The editor’s own evaluation and suggestion should accompany the review comments. The editor does not necessarily follow the reviewers’ comments or decisions but can make his or her own decision. This revision must be completed within two weeks. Author(s) can request the Editor-in-Chief to extend the due date up to an additional one week for the first revision with prior notice. 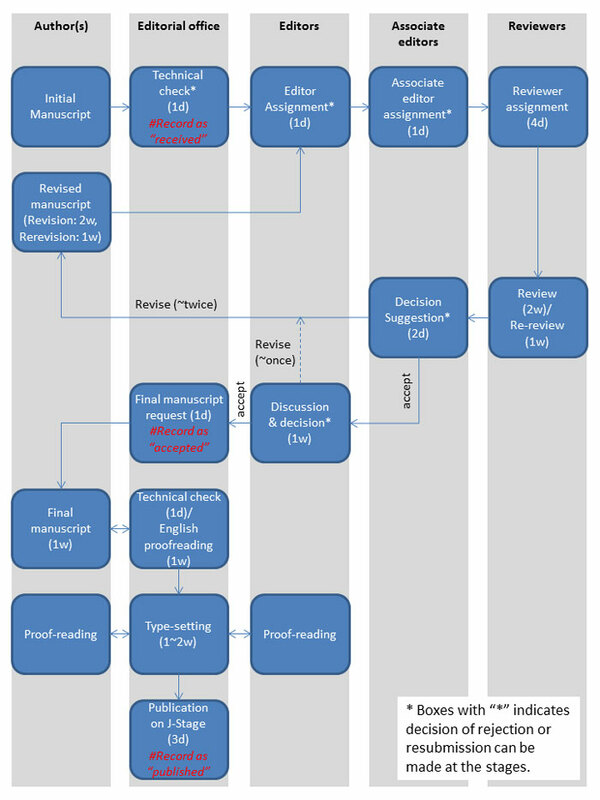 If reviewers note serious flaws with the material that would require extensive revisions, it is likely to take longer than three weeks and HRL encourages a resubmission of the manuscript. “Resubmission” is different from “Reject”. But it also means the editor encourages authors to submit the manuscript again after major revision; the paper has the potential to be accepted. If the revision is not finished by the due date, the editor reports it to Editor-in-Chief and the manuscript is withdrawn by Editor-in-Chief. Also, the author has a right to withdraw the manuscript after reading the reviewers’ and Editor’s comments. Editor-in-Chief sends the accepted manuscript to the Associate Editors to assess the fairness of the reviewing procedure. Based on this process, Chief and Associate Editors approve the final disposition. The manuscript is transferred to the publisher for proof reading and uploading. The publisher transfers the accepted manuscript to the English editor for English-proof reading, which is to be completed within one week. After the English editing, the author has a right to check the edited manuscript and confirm the corrections and then transfers the final manuscript to the publisher. The author cannot change the contents of the manuscript without permission from the editor even if he/she find an erratum. This proof should be finished within two days. After the English proof by the English editor and the author, the manuscript is edited for the format of Hydrological Research Letters by the technical editor, which is to be completed within two business days. The edited manuscript is sent to Chief and Associate Editors and the author for proofreading. The author has a right to check the edited manuscript and confirm the corrections. The author cannot change the contents of the manuscript without permission from the editor even if he/she find an erratum. This proof should be finished within five business days. The publisher asks the author to send the Publication Charge Certification and requests the publication charge to the author. The preprints request form is included in Publication Charge Certification (see item 13). The publisher uploads the manuscript on the J-STAGE. Chief and Associate Editors give the final approval to open the paper to the public. The electronic journal Hydrological Research Letters is printed in a paper media. The author can place an order for reprints by sending the Publication Charge Certification to the publisher (see item 11). The author is to receive the reprints about one week after the online publication.